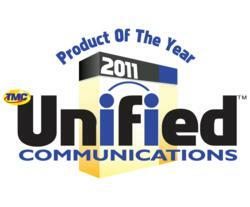 Nextiva Office recognized for innovation in business VoIP communications. Nextiva, a leading provider of cloud-based business VoIP services, announced today that it is a distinguished recipient of TMC’s Unified Communications Product of the Year Award for the second consecutive year. TMC, a globally integrated media company, has presented this award for the past five years to companies that brought ground-breaking advancements to unified communications technologies in the previous year. For Nextiva, the award represents more than recognition for the leading VoIP business solutions it provides to its small business customers. It also demonstrates their commitment to Amazing Service™ which includes every facet of the customer experience, from first contact through their business growth and expansion and their ongoing relationship with Nextiva. Nextiva Office delivers comprehensive VoIP phone services to small and midsized businesses, including powerful features such as advanced call routing, call screening and dial-by-name directories. Nextiva offers an online portal for owners and managers to have quick and easy access to all service and usage information. For more information on Nextiva’s business communication solutions, please visit http://www.Nextiva.com. Headquartered in Scottsdale, Arizona, Nextiva is a privately held member of the Unitedweb family of companies. Nextiva is one of the country's leading providers of cloud-based, VoIP business communication services. Nextiva has won more than 50 Independent Technology & Telephony Awards, including numerous "Product of the Year Awards" by Internet Telephony magazine. Nextiva delivers “Fortune 500” phone service at start-up prices and serves thousands of small-to-midsize companies across the United States. For more information call 800-983-4289 or visit http://www.nextiva.com.